In COPD is very important to reduce the exposure to risk factors. These factors include tobacco smoke, occupational exposures, air pollution. The most important thing in case of COPD is to quit smoking. This may help prevent the lungs from further damage and slow the progression of the disease. It is also important to avoid irritants that are worsening the symptoms, like air pollution, dust, chemicals, etc. Long-acting bronchodilators – preparations of the group of Methylxanthate and long-acting beta2-receptor agonists (Theophylline, Noviline, Formoterol, Salmeterol), providing prolonged dilatation of the bronchial tree. 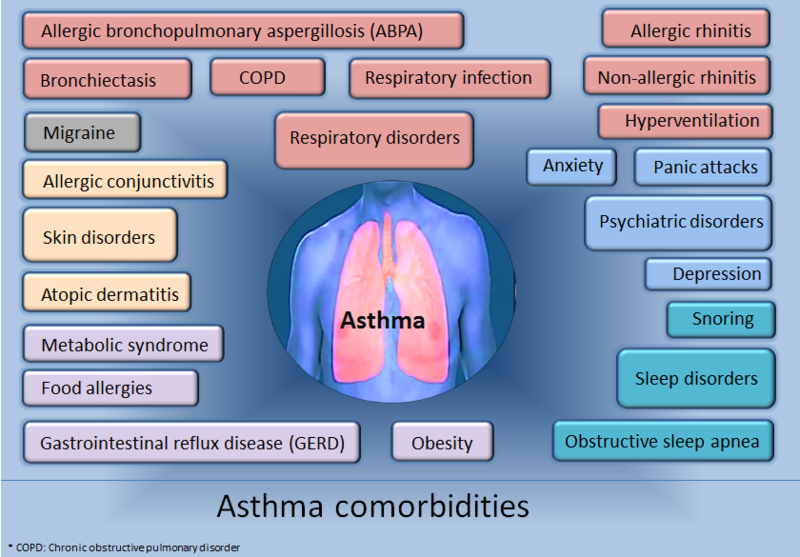 Inhaled corticosteroids – they are the “gold standard” in the treatment of asthma but are also used in COPD therapy. Despite their widespread use, the benefit of these drugs to COPD is controversial. They do not slow down the progress of the disease but reduce the frequency of exacerbations and improve the quality of life. Secretagogues – added upon exacerbation of the disease. Additional treatment – due to frequent exacerbations due to viral and bacterial infections, antibiotics have to be prescribed. Vaccines can be used to help prevent certain respiratory infections. The surgery is the only definitive treatment of COPD. The possible surgical procedures are lung volume reduction surgery and lung transplantation. COPD is a progressive condition, which typically gets worse over time. Lungs damaged by COPD can’t return to normal even with treatment. Factors, triggering asthma attacks, can be different for every patient. The attacks can be triggered by pets, pollen, dust, etc. For patients with asthma it is very important to avoid their personal triggers. Inhaled corticosteroids – the “gold standard” in asthma treatment. They provide relieve of chronic inflammation and suppress the allergic reaction. In severe forms of asthma, as well as during a severe asthma attack, they may be administered orally or intravenously. Long-acting bronchodilators – preparations of the group of Methylxanthate and long-acting beta2-receptor agonists (Theophylline, Noviline, Formoterol, Salmeterol). They provide prolonged dilatation of the bronchial tree and prevent the night attacks. Anti-allergic stabilizers – used in the prophylaxis of asthma attacks – Cromoglycates, Ketotifen. Leukotriene antagonists – a relatively new class of drugs used in the therapy of asthma – Montelukast, etc. Additional treatment– treatment of the prerequisites for the onset of asthma and its complications – antibiotics, mucolytics, secretolytics, treatment of reflux disease, etc. There is a relatively new surgical procedure which can be applied to relieve the symptoms of asthma. It is called bronchial thermoplasty and consists in the reduction of the ability of some muscles from the airway to constrict by burning them off. Asthma can be well controlled with a timely diagnosis and appropriate treatment. In children, it is possible to outgrow the disease as they get older. COPD Treatment: The treatment of COPD is driven by the need to control the symptoms. Its aim is to prevent the progression of the disease, relieve the symptoms, improve the patient’s health status, prevent/minimize and treat the exacerbations and complications, improve the tolerance to physical activities, reduce mortality. Asthma Treatment: The treatment of asthma is driven by the need to avoid/minimize asthma attacks. Its aim is to prevent the progression of the disease, relieve the symptoms, improve the patient’s health status, prevent/minimize and treat the exacerbations, maintain the function of the lungs as close to normal as possible, maintain the physical activity levels as close to normal as possible, prevent irreversible airflow limitations, reduce mortality. COPD Treatment: In COPD it is important to reduce the exposure to risk factors, including tobacco smoke, occupational exposures, air pollution. The most important thing is to quit smoking. Asthma Treatment: For patients with asthma it is important to avoid their personal triggers. COPD Treatment: The medications used in COPD are long-acting bronchodilators, secretagogues, inhaled corticosteroids, antibiotics, etc. Vaccines can be used to help prevent certain respiratory infections. Asthma Treatment: The medications used in asthma are inhaled corticosteroids, long-acting bronchodilators, anti-allergic stabilizers, leukotriene antagonists, medications for treatment of the prerequisites for the onset of asthma and its complications. COPD Treatment: The surgery is the only definitive treatment of COPD. The possible surgical procedures are lung volume reduction surgery and lung transplantation. Asthma Treatment: Bronchial thermoplasty can be applied to relieve the symptoms of asthma. It consists in the reduction of the ability of some muscles from the airway to constrict by burning them off. COPD Treatment: COPD is a progressive condition, which typically gets worse over time. Lungs damaged by COPD can’t return to normal even with treatment. Asthma Treatment: Asthma can be well controlled with a timely diagnosis and appropriate treatment. Children can outgrow the disease as they get older. The treatment of COPD is driven by the need to control the symptoms. Its aim is to prevent the progression of the disease, relieve the symptoms, improve the patient’s health status, prevent/minimize and treat the exacerbations and complications, improve the tolerance to physical activities, reduce mortality. Asthma’s treatment is driven by the need to avoid/minimize asthma attacks. Its aim is to prevent the progression of the disease, relieve the symptoms, improve the patient’s health status, prevent/minimize and treat the exacerbations, maintain the function of the lungs as close to normal as possible, maintain the physical activity levels as close to normal as possible, prevent irreversible airflow limitations, reduce mortality. In COPD it is important to reduce the exposure to risk factors, in asthma, it is important to avoid the personal triggers. The medications used in COPD are long-acting bronchodilators, secretagogues, inhaled corticosteroids, antibiotics, etc. Vaccines can be used to help prevent certain respiratory infections. The medications used in asthma are inhaled corticosteroids, long-acting bronchodilators, anti-allergic stabilizers, leukotriene antagonists, medications for treatment of the prerequisites for the onset of asthma and its complications. Inhaled corticosteroids are the “gold standard” in the treatment of asthma. They are also used in COPD therapy but with controversial results. The surgery is the only definitive treatment of COPD. The possible surgical procedures are lung volume reduction surgery and lung transplantation. In case of asthma bronchial thermoplasty can be applied. COPD is a progressive condition, which typically gets worse over time. Asthma can be well controlled with a timely diagnosis and appropriate treatment. Dr. Mariam Bozhilova Forest Research Institute, BAS. "Difference Between COPD and Asthma Treatment." DifferenceBetween.net. March 5, 2019 < http://www.differencebetween.net/science/health/difference-between-copd-and-asthma-treatment/ >.